It is rare to see a 17-year-old play in the World Junior Championship, but when it happens, the youngster is likely to have a promising hockey career ahead of him. That is the case for Auston Matthews, a hockey player who grew up in the non-traditional hockey market of Scottsdale, Arizona. The 6-foot-2, 194lbs centerman is already one of the top prospects entering the 2016 NHL Draft. 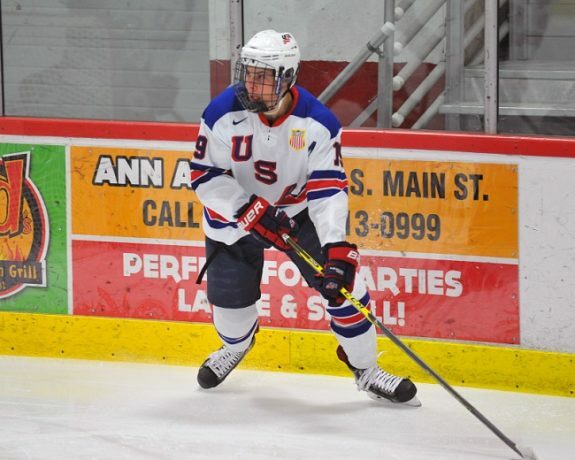 In 5 games at the WJC, Matthews tallied a goal, two assists for Team USA. Matthews currently plays for the prestigious United States Under-18 National Team Development Program, where the likes of Patrick Kane, Phil Kessel, James van Riemsdyk and 2015 draft prospect Jack Eichel once played. In 33 games, Matthews has 27 goals, 29 assists. He has yet to commit anywhere for college hockey next season. With strong skating abilities, smooth hands and puck control, and a large figure, it is no wonder Matthews is being touted as the next American hockey star. The Hockey Writers: What do you take from your WJC experience? Auston Matthews: It was a great experience. I got to play against a lot of the really high-end talent from Canada, Sweden and Finland. It was a good experience and I definitely take a lot from it. THW: What was going through your mind after the own goal on your first shift of the tournament? Matthews: It was definitely a little ratting on your first shift. I just tried to clear that from my mind and keep playing. THW: I’m sure you’re going to hear this question a lot, but what was it like playing with Eichel? Matthews: It was unbelievable. I had the chance to room with him too. I’ve known him since last year playing with the U-18’s. He’s an unbelievable talent, a great player, and a great person off the ice. THW: Did he teach you anything while you were playing together? Matthews: Nothing really on the ice. It was really mostly off the ice, trying to clear your head. THW: How do you characterize your game and who do you compare yourself to? Matthews: I try to be a two-way power forward, skilled, similar to a Jonathan Toews or Anze Kopitar. THW: How was it growing up as a hockey player in Scottsdale, non-traditional hockey market? Matthews: My uncle had season tickets to Coyotes games, so that’s how I got into [hockey]. I definitely had a passion for it when I started playing hockey. THW: You haven’t committed anywhere yet. Arizona State is transitioning to be a Division I college hockey school. Are you look there at all? Matthews: It’d be a possibility, but they’re going DI not next year but the year after. So if I make the decision to play college hockey next year, it would be next year and not wait another year. THW: What has the NTDP done for you as hockey player? Matthews: It has done a lot. It’s definitely been one of the best hockey decisions I’ve ever made. Just the off-ice training, coaching, the atmosphere of going overseas and playing in different countries, and to wear the USA logo every day is a true honor.